Bernard Webber, founder and president of the New Seven Wonder organizations expressed appreciation for the success of the Komodo dragon. According to Webber, dragons chosen because the number of voters in the voting of these animals ever done. Ministry of Forestry of Indonesia, Zulkifli Hasan who also attended the inauguration ceremony explained that the animals identified as the type of polyandry. Where one type of female animals, can have three to four male partners. 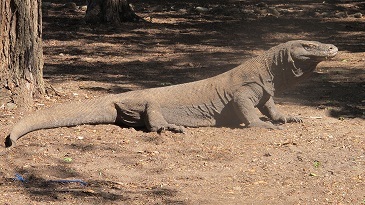 Meanwhile the number of Komodo, right now could reach 5,000 individual, scattered throughout the KNP. KNP management conditions by Zulkifli also quite restrained. It is recognized by Zulkifli, had been a conflict between the public and KNP officers. But the last three years, the conditions has became more conducive. According to the Minister of Forestry, TNK region has a complete ecosystem. Ranging from sea to land. On land there is the Komodo dragon lived. While at sea there are many different types of animals that should be preserved. In the fact from dive inspection on Thursday (12/9/2013) in the KNP, some areas dives looks maintained continuity. On Batu Bolong dive site, there are a lot of small fish such as butterfly fish roam. While at the dive spot called Shotgun, visible coral reef looks still in good condition. “There is a 40 point dive in Komodo National Park,” said Zulkifli. Former Vice President of Indonesia, Jusuf Kalla as the ambassadors of Indonesia komodo dragons was pleased with the launch, the new seven wonders of the natural world. He states had found it difficult to get support. But do not be mistaken, millions of people choose dragons as one of the new seven wonders of the world. The president himself only came for about two hours in the KNP. After witnessing the inauguration and dragons eat goat demonstration, the President returned to Labuan Bajo, NTT. President planned to stay in Labuan Bajo, to attend the summit of Sail Komodo, which will be conducted on Saturday (14/9/2013 ) at NTT. This entry was posted in Biodiversity and tagged batu bolong, komodo dive, labuhan bajo, modo, new seven wonder, shotgun. Bookmark the permalink.